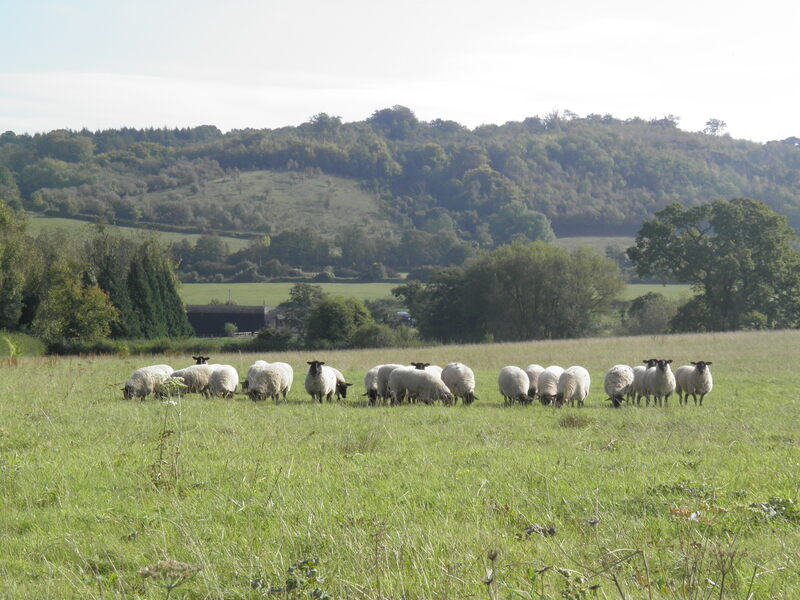 An easy and rewarding walk along the rolling Darent Valley in north-west Kent, linking 2 very different castles, a Roman villa and 3 stunning villages and plenty of good pubs, via riverside paths and sheep-grazed pastures. Underfoot: Well-made paths and minor roads. Short sections could be muddy after rain. Getting there: Farningham Road is served Monday-Sunday by hourly Southeastern services from London Victoria (36 mins) via Bromley South (15 mins) for connections from London Blackfriars via Elephant & Castle and Peckham Rye. 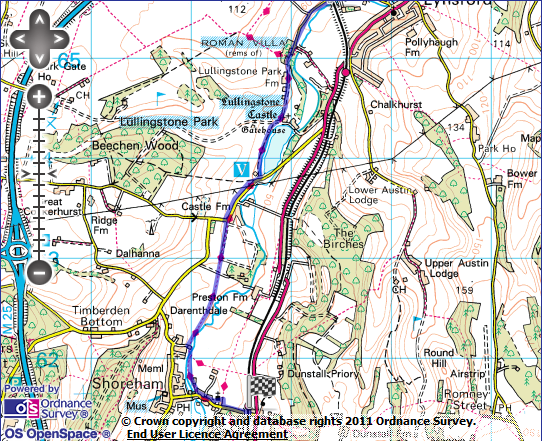 Useful websites: Much of this route follows the waymarked Darent Valley Path. Visitor attractions passed on route include Lullingstone Roman Villa, Lullingstone Castle & World Garden and Eagle Heights Wildlife Park. Getting home: Shoreham is served by half-hourly Thameslink services to Kentish Town via Bromley South (24 mins) for connections to London Victoria, Peckham Rye (44 mins), Elephant & Castle (54 mins), Farringdon (67 mins), London Blackfriars (58 mins) and London St Pancras (72 mins) . Fares: As Farningham Road and Shoreham are on separate branches which split at Swanley, it’s necessary to buy two tickets to cover this journey. The cheapest way to do this from central London is to buy a day return London – Shoreham (£10, child £5, railcard £6.60) and a single Swanley – Farningham Road (£2.30, child £1.15, railcard £1.50). All trains to Farningham Road call at Swanley, so there is no problem with ‘splitting tickets’ there. Farningham Road station, opened in 1860 by the London, Chatham and Dover Railway, lies around 2 miles north of the village it purports to serve, on the edge of the large, mainly modern village of South Darenth. turning left down the station approach. At the end, cross the busy Dartford-Sevenoaks road with care and continue straight ahead on a road descending between allotments and the railway embankment into the river valley. After about 300m, with the imposing brick viaduct to the left, turn right at a footpath sign to join a clear path beside the River Darent. The walk follows the Darent pretty much throughout. The river is a 21-mile long tributary of the Thames, rising near Westerham and emptying (as Dartford Creek) near Crayford Ness. The Darent powered numerous mills, one of which – Horton Kirby paper mill – was under the railway viaduct. From the early 1990s, urgent action (including closing boreholes) had to be taken by the Environment Agency to tackle diminishing levels of water flow in the river, which threatened river-side ecosystems. 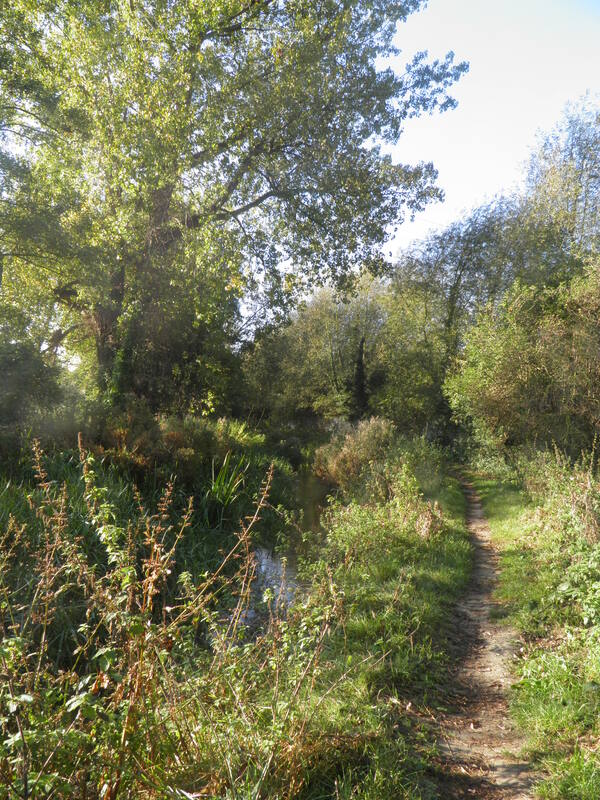 Walking beside the river, you are likely to encounter some of the wildlife which has benefited from this work, with a reasonable chance of glimpsing a kingfisher. The path sticks close to the western bank of the reed-filled river, past a footbridge giving access to the fishing lakes to your right. Through the trees across the river you begin to catch glimpses of the square church tower at Horton Kirby, before emerging on the Westminster playing fields, named after a corn mill across the river in the village. Ignore the footgates to the left bearing the initials of the parish council and pass in front of the brick clubhouse to reach a gate at the south end of the playing fields. From here a broad path cuts across a pair of fields to regain the river bank. A short distance on, you emerge on a minor road next to a narrow arched bridge. Turn left across the bridge and walk around 200m along the road until you reach Horton Kirby Cricket Club. Beside its tumbling wicket sign, turn right on a fenced footpath beside the pitch. As you walk along this path, you will get brief glimpses through the trees across the river of Franks Hall, an Elizabethan manor house completed in 1591, although there has been a manor on this site since the 13th century. bridge carrying the A20 Farningham by-pass. Along with the old main road through the centre of Farningham which you will meet in a few minutes, these are three generations of roads to Dover. 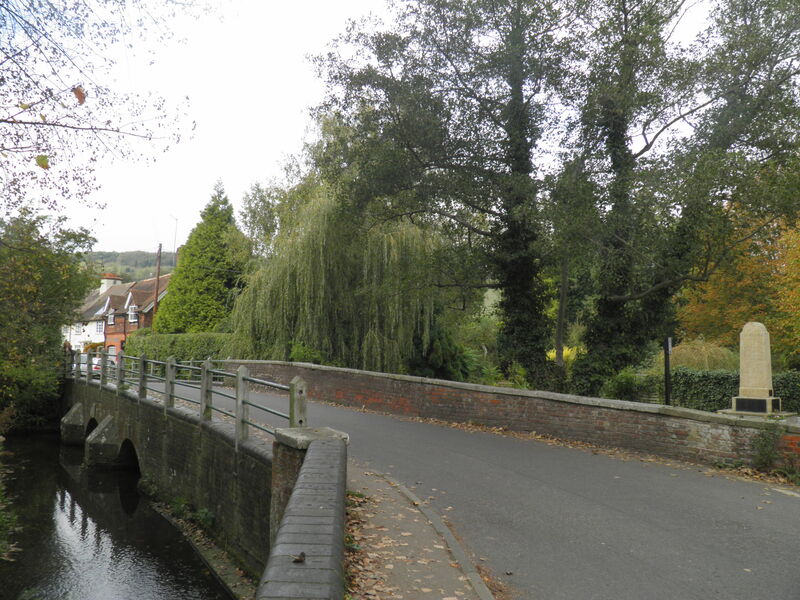 Immediately after the A20 bridge, cross the river on a wooden footbridge and follow the river bank into the village of Farningham. As you emerge from woodland, ignore signs pointing the Darent Valley Path to the right and continue straight ahead through the beer garden of the Lion Hotel to reach the road bridge. As you enter this open area, you are greeted by a fantastic ensemble of buildings in an idyllic setting. To your right, the 18th century Lion Hotel, supposedly once visited by Charles Dickens; ahead is the white weather-boarded corn mill, converted to private houses since it last ground in 1900; and to your left a curiosity – the Farningham cattle screen. Almost unique in Britain, this ornamental mini-bridge dates from the 18th century and was probably a means of preventing cattle from wandering down the river. It was heavily restored in 2008. At the bridge, turn right up the attractive high street, complete with second-hand book shop, butchers and Indian restaurant and then take the first left (SparepennyLane). Around 200m along this road, just after Hampton Court Cottage, turn left through an unwaymarked gap in the hedge and through a kissing gate. From here, the Darent Valley Path runs south on a permissive path paralleling the road, with superb views into the valley both back towards Farningham and forward to Eynsford. You pass through two fields, a young Woodland Trust plantation and one further long field before rejoining the road at entrance to Eynsford village. route towards Shoreham turns right, but it is worth taking a short diversion left into the centre of Eynsford and its numerous pubs, past Home Farm to the scenic packhorse bridge and ford beside the Plough Inn. Crossing the bridge and turning left in front of the church, and past the war memorial will bring you to the Castle Hotel, whose wall still advertises ‘Motor Pit, Garage and Stables’. 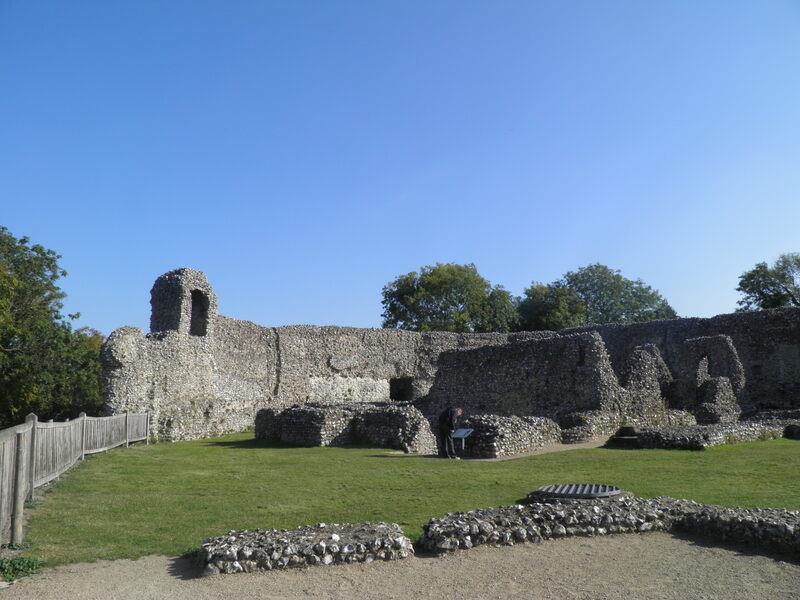 Opposite the hotel, a small road leads down to the substantial remains of Eynsford castle (free admission). most of the internal buildings destroyed. The site was sold to the Hart family of nearby Lullingstone castle, who subsequently used the remains at Eynsford as hunting kennels! 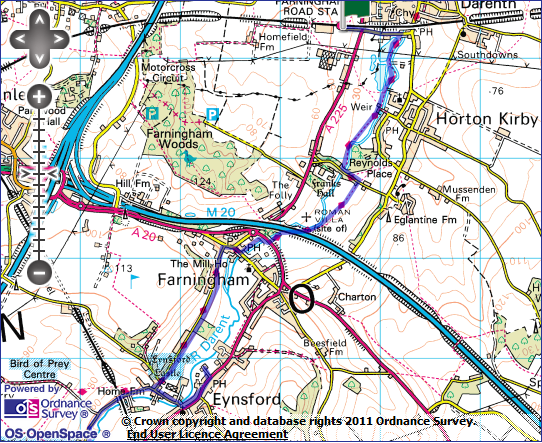 Return to the junction with the road from Farningham and continue straight ahead towards Lullingstone castle. This minor road curves through the water meadows of the Darent, often grazed by highland cattle, before passing under the attractive six-arched railway viaduct. Continue past the entrance to Eagle Heights Wildlife Centre and you soon arrive at the modern building enclosing the remains of Lullingstone Roman Villa. Lullingstone Villa would have been set in a large estate and owned by an (unknown) wealthy family. Construction on this site would have started in the early 2nd century AD and gradually developed over the next couple of centuries – it was one of at least seven villas in the Darent Valley and is by far the best preserved. Alongside the remains, the modern museum includes remarkable mosaics and two skeletons. A short walk further along the road takes you past Lullingstone Park Farm and alongside the high hedge surrounding Lullingstone Castle to the 16th century brick gatehouse. Lullingstone Castle is a distinctly un-castle-like manor house, dating from the late 15th century, though most of what survives is of Queen Anne vintage. 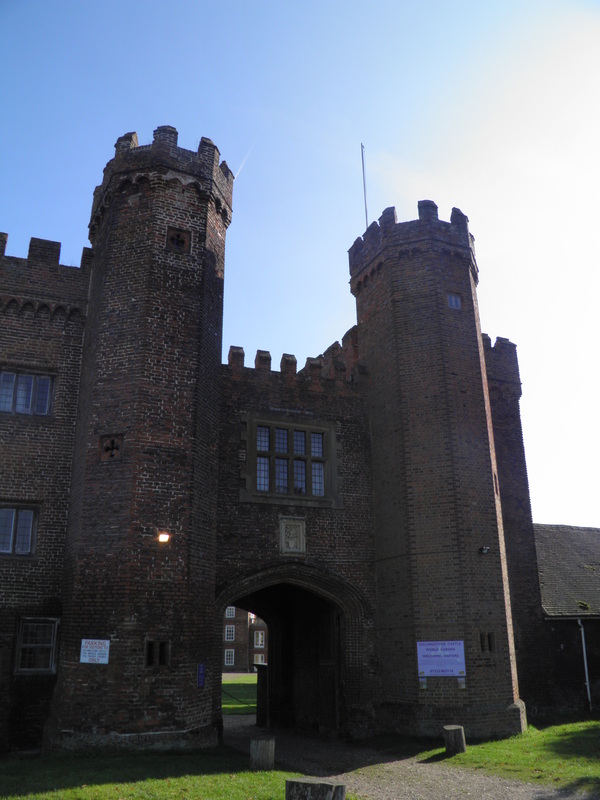 The original owner was the Sheriff of Kent, and Henry VIII was a frequent visitor. The Tudor gatehouse was probably the first to be fully constructed of bricks. As well as the castle, the park contains St Botolph’s Church, with the oldest stained class window in England, and the World Garden, developed by the castle’s current plant-collecting owner, which featured in the BBC series Save Lullingstone Castle. Past the gatehouse, veer right through the small car park and take the kissing gate at the end. This leads onto a clear and popular riverside path, with glimpses of the castle’s fishing lake across the river through the trees. After around 500m you have the option to turn right to the Lullingstone Park visitor centre, with a cafe and toilets or keep straight ahead. Either route takes you out onto Castle Road. Turn right along the road and immediately after the first bend veer right over a stile onto a permissive path beside the road. You pass a lavender field and then the Hop Farm Shop. Where the path turns uphill, turn left through a gap in the hedge and cross the road to join the signposted footpath immediately opposite. This clear path takes you past a hop field, across a tarmac track and rejoins the river bank. Eventually you emerge on a minor road, turn left to the gate of Mill House, then right on a signed path. 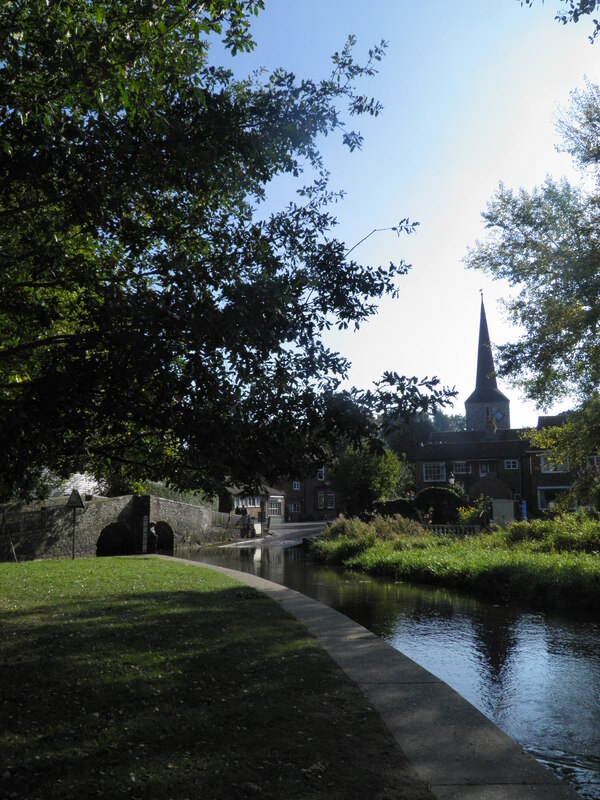 This crosses the river – here resembling a mill leat – by an attractive row of cottages. Immediately after the bridge, take the tarmac path to the right, which leads into Shoreham, past a vineyard and flint-knapped houses to arrive at the low-three arched bridge. Remarkably, due to several local houses being taken over for military use, this sleepy Kent location was the most bombed village in Britain during World War 2. The attractive centre of Shoreham village lies to the right, over the bridge. To reach the station, however, head left to reach the 16th century Ye Olde George Inne. Instead of following the road to the right, head straight ahead through the lych gate (inscribed ‘Blessed are the Dead which die in the LORD’) and along the yew avenue through the churchyard and past the parish church. At the end of the churchyard, pass through a kissing gate, right on the track the other side of it, to regain the road. Turn left along the road, heading slightly uphill to the railway bridge. Immediately after the bridge, steps lead left up to the station, with a pleasant tea room in the old station house. Great walk. Clear instructions that were mostly still very accurate. Thanks! Another fine walk and my 6th from the site. Thanks! 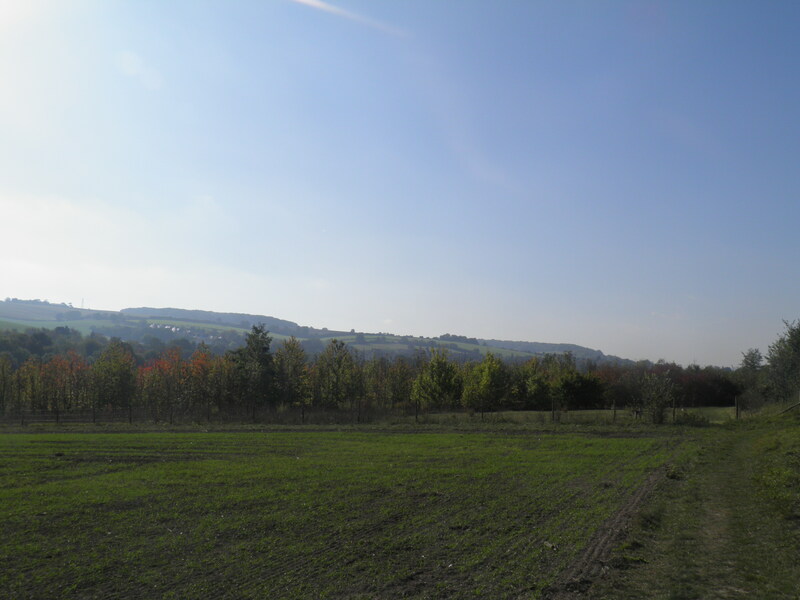 I extended the walk on a couple of miles to Otford along the Darent Valley Path which was well worth the effort too. This is a fantastic walk, really well detailed. Thankyou. 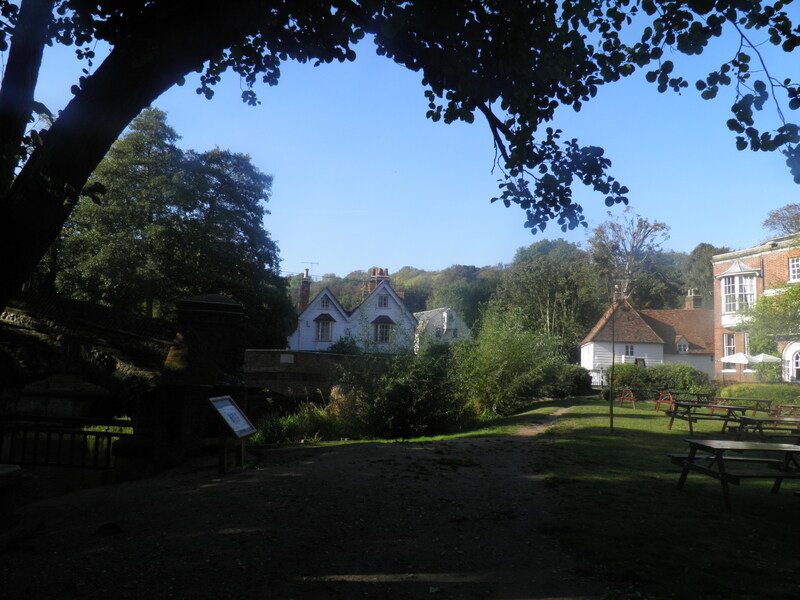 I recommend the pub at Farningham by the river – great spot ! 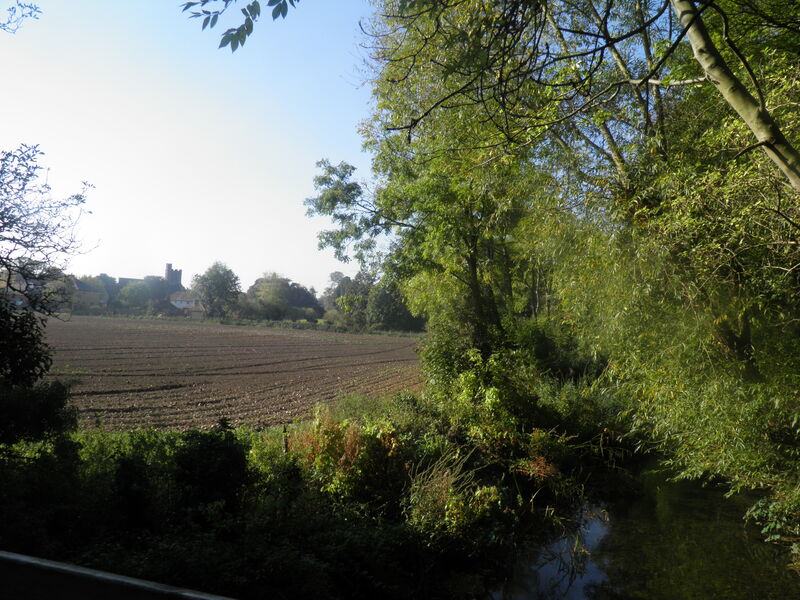 We did part of the walk from South Darenth to the Lion pub in Farningham and back after a nice drink in the sun in the pub garden by the river. 😃 Lovely walk we have lived here for a couple of years and never realised they was a river walk so near. Thank you Linzi.